My husband loves eggnog. Or “nog” as he usually refers to it as. I am pretty sure it’s why I can get him to do the grocery shopping easily in late fall, because he’s stalking the dairy department for eggnog. Eggnog is take it or leave it for me, it’s more the texture than the flavor that just isn’t my thing. The flavor I like, the bordering on shake like consistency, not so much. 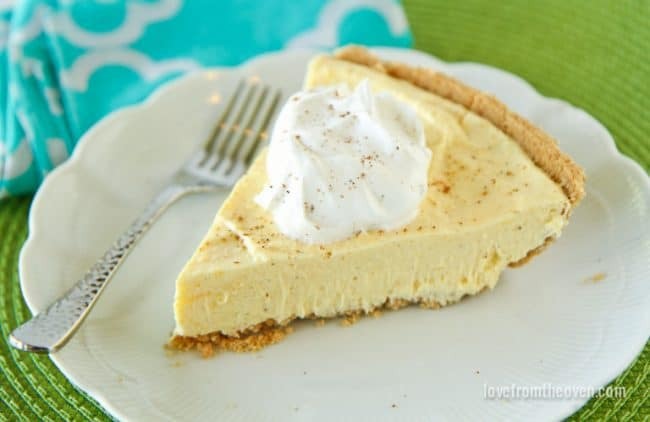 While I was making a chocolate pie this weekend, it dawned on me that replacing the milk with eggnog in a vanilla pie would result in a super easy eggnog pie. I’m by no means the first person to think of this, which is kind of how food blogging goes. You think of something and think, oh wow, great idea! And then if you go search Google or Pinterest, you are sure to instantly find out that 398,083 people have had the same great idea. And the idea was probably in a kindergarten class cookbook in like 1978. And one of those magazine like little holiday cookbooks at the grocery checkout, most likely in 1986. I had like six months where I would Google every single recipe idea I had, thinking every last one had to be completely original. Yeah, that whole re-inventing the wheel thing, um, not so easy. It was super stressful and no fun whatsoever. Everyone has pretty much made everything. And that’s okay. I eventually figured that sometimes you just have to make and share the recipes that you love (or, that your husband loves) and leave it at that. Eggnog pie anyone? A warning, this is rich. Well, I mean, it’s made with eggnog, which is basically like drinking cream, so yeah, rich. You could totally cut back on some of the eggnog and replace it with milk. 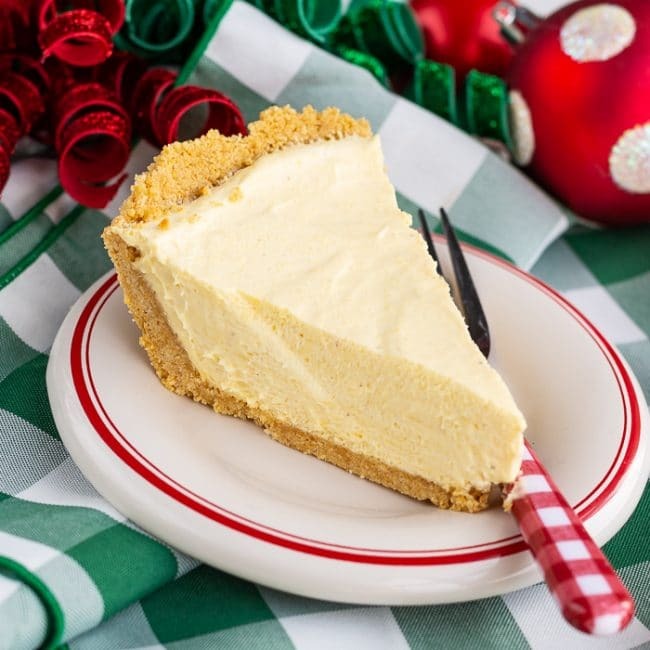 Oh, also – one thing to pay attention to – the premade graham cracker pie crust my eggnog store searching husband picked up, was a bigger pie crust – “two extra slices” or something like that. While that’s great and all, pie crusts are kind of a standard to some extent so a jumbo one can mess with your recipes. I was a little short on filling for this, and sort of pushed more of it towards the outer edge. Just something to pay attention to if you are buying a ready made crust. 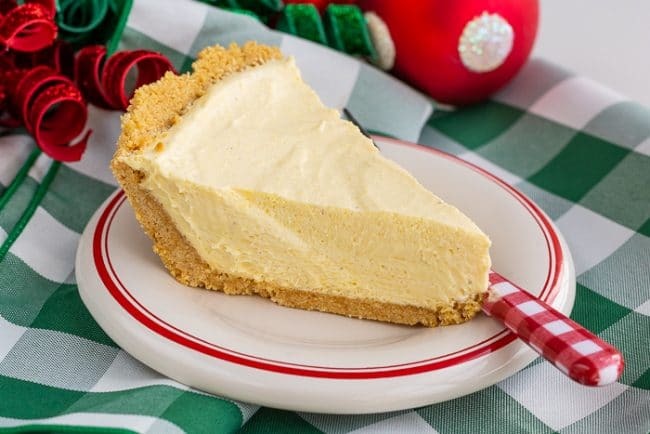 This delicious and easy no-bake EGG NOG PIE is quick to make and always a huge hit in our home. Beat pudding mix with eggnog, milk and nutmeg for two minutes. Fold 1 cup COOL WHIP Whipped Topping into mixture until just combined. See, as I said, super EASY! 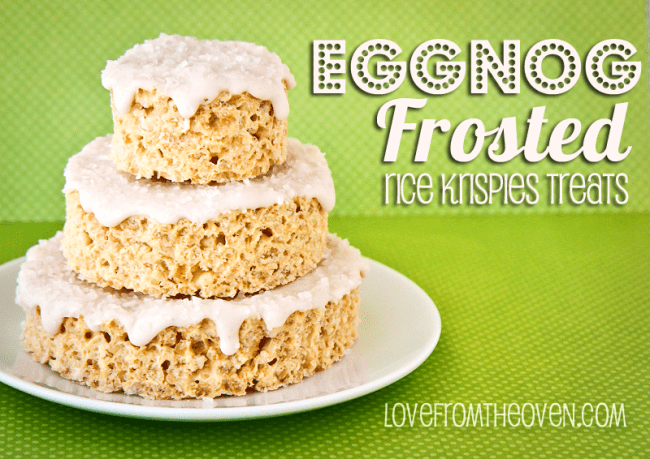 If you have eggnog lovers in your family, this is totally for them. And here are a few more recipes that are packed full of eggnog deliciousness! And 50+ really delicious eggnog recipes! This looks great! I have been doing the same thing to myself. I think up a recipe to try out in the kitchen and sure enough…after googleing the idea, I see that it’s been done and looks way prettier than I think I could ever make it. It’s nice to know that it really doesn’t matter and that I should just make and share what I love. I’m with you on the eggnog. Something about it being so thick and cold… ehhh, not a fan. 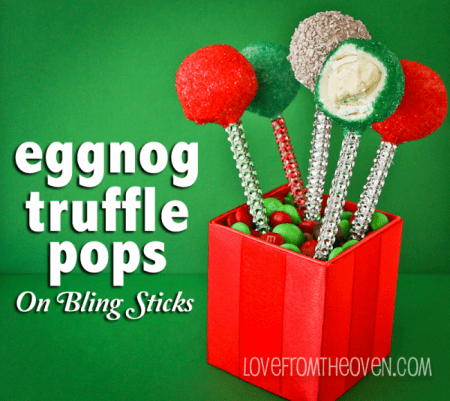 I’m all about treats with eggnog in them though. I want to make this immediately! Amanda, I’m glad it’s not just me. I seriously have to ration my husband’s eggnog consumption, it’s dangerously close to needing a 12 step program, and I almost gag a little watching. The flavor is awesome, but can’t get over the texture! Hope you aren’t totally freezing by the way! What? Google a recipe? LOL, never. 🙂 Love this pie! I’m so glad that eggnog is finally starting to be in season! 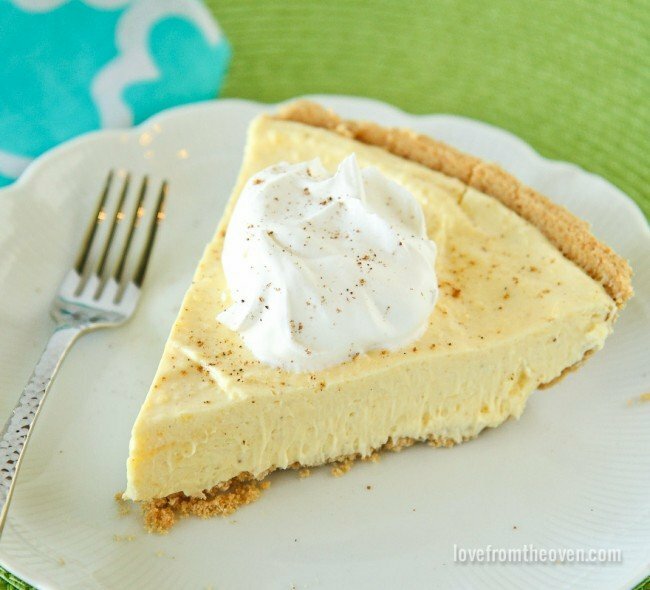 And I love this pie recipe and how easy it is! Pinned! You could drive yourself crazy with too much google! This pie is a great idea, looks yummy!!! oh this recipe is definitely for me. Like your husband, I love love eggnog – most especially Bordens in the refrigerator carton. Does your husband like this pie? Is it a strong enough eggnog-flavor? I would want it to! Thanks for giving this to us less-imaginative cooks out here. Thank you! Good to know the egg nog flavor is good & strong. That’s what I love! I’m so making this!! I’m with you in that I love the flavor of eggnog But not how thick it is. My solution is mix half eggnog, half low fat milk. Add fresh ground nutmeg. Refrigerate overnight. It is Soooo delicious!!! 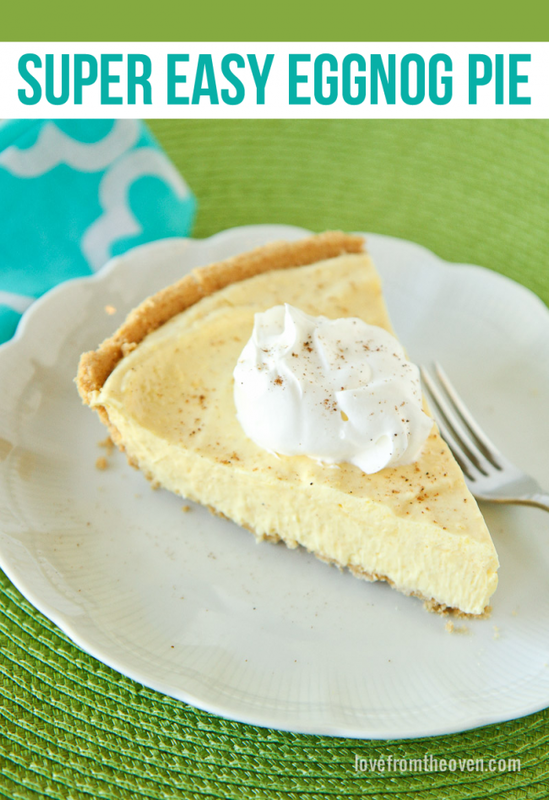 Have you ever used a regular pie crust instead of a graham cracker crust? If a regular piecrust can be used, would it be baked prior to filling it or bake it with the pie filling? Oops! I just re-read the instructions- it is a no-bake pie!!! So if I used a pastry pie crust, it would of course be baked prior to filling & chilling! having a Christmas ornament exchange party. I am going to try this with mini pies. (like mini cupcake sized) I was toying with the idea of something lemon- I will have lots of chocolate- but this is LOTS more holiday to me than lemon! Love it thanks! I don’t really care for eggnog, but my sweet daughter-law-loves it. I made her some eggnog cookies, have to admit they tasted pretty good and the family ate a bunch before I could get them to her. I am going to make this tomorrow for her. Dianna, I hope she enjoys them as much as everyone enjoyed the cookies! I don’t care for the consistency of eggnog either so I “cut it” with an equal part of milk. I love to heat it up in the microwave and then top it with nutmeg! The milk doesn’t really take anything away from the taste that I can tell. I bet it would work just as well if you left it cold. That sound pretty good Angel, I need to try that! This looks and sound delicious. Try.Try eggnog fudge it’s delicious! I too am a big fan of eggnog! Before it sets is it kinda runny? Or did I screw up lol. Darcy, mine was pretty darn thick. Were you using a reduced fat or skim eggnog? I’m thinking this would be delicious with a gingersnap cookie crust. Or, for the person who was going to make mini ones in a cupcake tin, you could just place the whole gingersnap right in the bottom of the muffin cup and then top with the pie mixture. May try this later today! When you say “normal” and “jumbo sized” pie crusts, about what size are they? My supermarket just calls both sizes pie crusts (no jumbo or oversized printed on the package!) but one is a 9 inch, 6 oz. pan and one is a 10 inch, 9 oz. pan. The one inch size different doesn’t seem like a big deal, but three ounces does. Sorry if it seems like a silly question! Kandice, so I just spent a whole bunch of time on the JELL-O site, and what do you know, there are a variety of sizes depending upon flavor. The vanilla should be 3.4 (I’ll change that) but some flavors are 3.3 and some are 3.8, 3.9, with the majority being 3.4. They are all over the place! So yes, 3.4 would be the standard size for the vanilla. Though possibly not the French Vanilla, if that makes sense. 🙂 I have a feeling that they each end up yielding the exact same amount of finished product though. Thanks! Yes, I noticed that at the store when I checked all the different flavors. The cook and serve vanilla is only 3 oz. I figured it was the right one. Most people probably won’t even check that and just pick up the box. Unless of course they have a fail like I did. Kandice, I was surprised at how much variation there is between different flavors! Just made this for Christmas Eve. Yum! Passed the spatula test for sure! Going to make another one for the inlaws tomorrow using pumpkin flavored eggnog and pumpkin spice pudding! 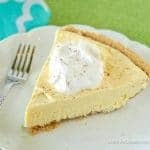 Is the Graham cracker crust shell cooked or uncooked before adding filling? Char, no need to cook it! Hi, could you use cheesecake flavored pudding instead of vanilla? You ever try that? Do you cover this while it’s in the fridge? Do you just use plastic cling wrap? Does it develop a ” skin” on top from it being refrigerated overnight? I bet the cheesecake flavored pudding would be fantastic! I do cover it with plastic wrap while it’s in the fridge. Hi, do you think it would still taste good if I didn’t use the nutmeg? Erica, it would however nutmeg is probably the main thing that gives it the eggnog flavor. Without it the eggnog flavor will be a bit less. Sounds like a good recipe for eggng pie I may try it can add vanilla or cinnamon if person doesn’t care for nutmeg I usually add nutmeg cinnamon vanilla and some rum to my eggnog pies which are made with eggnog unsweetened gellatin which thickens the eggnog I usually use a Graham crackers crust pie or cookie crust. I can’t remember all of my recipe. I was looking for help. I just found this site so hopefully I get a response… lol. The 8oz of Cool Whip is that 1 cup (8oz) or the entire tub which is also 8 oz? I don’t know if I should include the entire 8oz tub of cool whip. Brooklyn, you’ll need to measure one cup of Cool Whip from the container, not the entire container. Hope that helps! I’ve made this recipe a few years in a row now for Christmas. I’m wondering if it’s okay to put the pie in the freezer instead of the fridge? Hailey, I haven’t tried so I can’t really speak to the results. Sorry! This is delicious! Great flavor, but not overly rich. Hi I was wondering if I can make it the night before and just keep it refrigerated until I serve it? I have 4 other pies to make. Tiffany, yes, you actually want to make this ahead of time, it needs to set up as it’s a pudding based pie. Has anyone tried adding alcohol to it, like Jack Daniels? We always have a dessert competition where we use alcohol in each dessert. Jack Daniels and Eggnog go well together as a drink so I would think it would do the same for this pie. But then how much? 2 tablespoons? I just want the flavor, not everyone getting drunk! I used sugar free, added rum, and it turned out perfectly. Delicious. Liz, that’s great to hear! Sounds pretty tasty with the rum!